When I was serving on the board of our local YMCA, a national touring team of Christian strong men/ bodybuilders wanted to make a presentation to our youths. Through various exciting well choreographed displays of strength (chopping through cinder blocks with their bare hands and etc.) the ministers taught kids Christian values and principles. Our female chairperson of the board rejected their proposal. She said their display struck her as promoting violence. I thought, “Give me a break.” Since when did any hint of maleness become a bad thing? When I was a kid, I saw the movie, “A Flower Drum Song.” One of the songs was, “I Enjoy Being a Girl.” Well, I proudly proclaim, “I enjoy being a guy.” As a kid, I wanted to grow up to become an artist. But even more than that, I wanted to grow up to become a man; brave, strong and always attempting to do the right thing. I know that sounds a bit corny. Blame it on my dad because this is the image my four younger siblings (three brothers, one sister) and I had of him. I saw a great old movie based on a true story titled, “Lifeboat.” After a shipwreck, a young captain attempted to save as many survivors as possible who were crammed well over capacity in a lifeboat. The captain was forced to make extremely difficult decisions; rationing food and water, dumping the almost dead overboard. A weak leader who refused to do what needed to be done would have caused the deaths of everyone. Despite strong criticism and mutiny by some, the courageous young captain took responsibility and made painful decisions which saved the lives of most of the survivors. Upon their rescue, everyone in the lifeboat was overwhelmingly grateful to the brave captain even calling him a hero. Once safe and secure on dry land, they called him a murderer. How typical. Eagles fly alone. Where are America's great men? America needs politicians of character and strength who will say, “No” to entitlement/redistribution programs. Such counterproductive programs become law when we are seduced by characterless politicians. These scoundrels skillfully appeal to our lower nature by playing the class envy card. Like perfect suckers we demand, “Let's get those rich S.O.Bs who have succeeded on the backs of the poor!” It is also time we say no to our Oprah-ized society where everything is about feelings and everyone is a victim. A 1992 TIME Magazine cover read,”Why Are Men and Women Different?” Amazingly, this simple obvious truth was reported as a major scientific discovery. 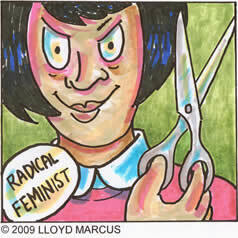 To a certain degree radical feminists have been successful in their quest to wimpify American men. You see it in everything from the way news stories are covered to national political issues.